He has always been interested in technological advances in dentistry and was one of the first dentists in the UK to practice laser dentistry, (starting with diodes in 2001). Always endeavoring to be on the cutting edge, he has Diode and Erbium lasers and uses these daily and always in implant surgery. Keen to teach his knowledge and skills to others, he is a member of the Academy for Laser Dentistry and has lectured in the UK and abroad on both Lasers and Guided implant surgery. 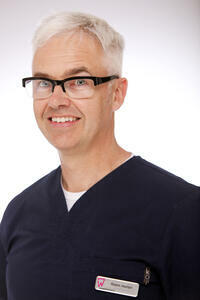 Robin started placing implants over 13 years ago and has placed well over 2000. He started doing guided surgery for more difficult cases about 8 years ago, but now uses guided surgery for almost all of his cases. He has placed over 360 cases using guided surgery. Wayside Dental Practice has three erbium lasers (Waterlase) and three diode lasers. Making laser dentistry accessible to all patients, Wayside Dental Practice has a team fully trained in laser use to include: all dentists and hygienists and the periodontist. Technology is enabling us to diagnose, plan, do our surgery and generate our restorations with a much greater degree of predictability than ever before and the new technologies really lend themselves to working side by side with lasers. We can be minimally invasive, give predictable results with very little tissue disruption, leading to less pain and stable post-operative tissue. This in turn means better socket preservation, less if any recession and happier patients who experience less swelling and often no discomfort post operatively. Most dentists will now have access to a CBCT scanner locally so can make use of highly advanced planning software provided by implant companies and be able to print out accurate drilling guides. There are also systems where we have virtual sat nav surgery with real time feedback, no physical guides required, meaning that safe flapless or mini flap surgery is possible in lots of implant cases. Intra oral scanners have been developed to help us fabricate our restorations with the utmost accuracy in the digital workflow, also providing our technicians with failsafe impressions. Dental Lasers are invaluable in surgery and to help give a clear picture/impression and sculpt the soft tissues for a more natural looking and cleansable contour to our final restorations. In order to be able to place our implants in such a way as to have an aesthetic looking restoration we need to keep as much bone as we can. The more of the original bone we save, the better the final restoration will look and the easier it will be to maintain the shape of the gum which will more closely mimic the original tissues with less awkward nooks and crannies for patients to have to clean round. Using a Waterlase all tissue dental laser to first expose the extraction site, removing excess or inflamed gingival tissue helps with visualisation. If you can see what you are doing the extraction process is so much easier. You get very little if any bleeding using a laser on soft tissues, helping to keep visibility excellent. Because Lasers are very delicate fine tipped tools capable of very precise, controlled tissue removal, it is essential to use magnification, but I firmly believe that all dentists and Hygienists should be using magnification in any event! You can then switch the laser setting and use it as a periotome, to remove the ligament around the root. In multi-rooted teeth you can also use the laser to section the roots. In using lasers I am almost always able to remove the teeth with the socket or sockets intact, keeping buccal bone height and allowing me to place an immediate implant if the situation and our plan warrants it. Following the root removal I switch the settings to debride the socket and make perforations in the cortical wall to encourage bleeding (and therefore healing) into the area. In conjunction with your normal tools this ensures no unwanted tissue is left in the operation site. The new Radial Firing tips are very helpful for this. The laser energy also stimulates healing cells to come to the area and encourages lymphatic drainage, and reduces histamine release, as well as being bactericidal. This all means that you can get the tooth out cleanly, leaving the bone almost intact, there will be no infected soft tissue remnants left in the socket, clot formation can start on clean bone, which you have perforated to encourage bleeding, there will be very little post operative pain, the healing will be fast and good, an immediate implant has a very good chance of taking and you will have very little chance of recession. The aforementioned technologies will have allowed you to plan the position of the implant and ensure adequate bone for the implant and space for blood vessels, and of course you have placed the implant gently so as not to damage the bone yourself and undo all the good work of the laser! To raise a flap and or for grafting, I would use a laser instead of a scalpel. The laser destroys far fewer cells either side of the cut than a scalpel, healing is scar-less and recession is minimal. Following surgery a diode laser with a healing tip playing laser energy over the site also helps the healing process. I have got so used to using lasers that I sometimes forget how brilliant they are, new staff members will often point out how incredible it is to have a bloodless field, such a clean site, no swelling, no patients phoning with post operative complications and almost no pain following the surgical procedures. We also use lasers again at the review appointment when we assess the healing and check everything has settled. I use a diode laser with a healing tip again to put some laser energy into the site again. This helps speed the healing and again reduce any inflammation that might be there. There is a slowly increasing body of research that suggests bone density is improved by this. The final time we use lasers in the implant process is during the restorative phase. We can create ovate pontic sites for bridges and we can tissue sculpt the emergence profile for anteriors to give them a more natural appearance. The smoother and more rounded the final shapes we create the easier it is for the patients to maintain these restorations later. As I write this I can’t help feeling that the only people not keeping up with the technology are the patients! We can be as whizzy as you like, it still all goes to pot if they don’t look after it all afterwards! With this in mind we need to make the restorations as tooth like as possible and as smooth and rounded as we can in the fit surfaces. The last few years we have been very aesthetics driven, sometimes at the expense of hygiene access for the patients, If we struggle to get a tepe brush or implant floss in there, then the patient has no chance. If an implant does get into trouble later with infection, (peri implantitis), then we have a great chance of curing it with lasers, the side firing tip recently introduced by Biolase is an excellent tool to help us in this. It depends why we have the peri implantitis in the first place as to whether this will work and how soon it is spotted. Peri implantitis is multifactorial, operator error at placement is probably the biggest single cause, trauma to the tissues, not enough bone all round the implant to start with, poor keratinised mucosa, glue from cement retained crowns being left around the implant. Then we have the patient factors, highly susceptible to periodontal disease patients are probably more likely to get a similar type of disease on their implants, poor cleaners, bruxists, immunocompromised etc. But as a general rule if the implant is stable then it is worth trying to treat it, ideally remove the coronal restoration too to reduce the load on it and bury it following treatment, but that isn’t always possible. If the restoration has to stay in, then you just treat the implant as if it were a tooth with periodontal disease and the results have been surprisingly good, even when things looked hopeless. Unbalanced occlusion, multiple failing teeth, poor function and aesthetics. 50 year old female. Transitional chrome dentures used as Dahl appliances, removed hopeless teeth, placed implants, placed intermediate composite restorations, then after finalising occlusion placed definitive ceramic restorations. Waterlase used for all extractions, for debriding sockets and tissue sculpting. Diode laser used for healing. Punched in face – during bizarre game with friend! Central fractured ½ way down root face, buccal bone loss to half way down where fracture was. Laser as periotome, root fragments removed, socket debrided and cortical bone perforated with laser to aid blood flow. Immediate implant placed with grafting. Temp crown placed immediately cut away to allow maximum soft tissue growth. Diode laser used weekly initially to aid graft formation. 2. 5 Year review Stable gingival margin, some scar tissue evident, but not surprising following injury. 30 year old female assaulted by boyfriend. Avulsed one tooth and subluxed another. Plan was to remove and replace with implants if possible – very thin bone. Repositioned and laser treatment weekly for four months - medium term splinting and up to now following root treatment – using - you guessed it - lasers to clean the canals and disinfect them, so far no infection and excellent soft tissue healing - just as well as she is so small and normal bone is so thin it would be a very difficult case. 3. Planning on CBCT DX IMPLANT STUDIO shows how little bone we have to play with or graft to. 5. One Month later – no mobility massive loss of soft tissue still. Teeth have been root filled now- dual wavelength technique Waterlase and diode laser. 6. Three months later- I think I was more surprised than she was!